TouchTunes Releases 2015's Top Played Jukebox Artists and Songs. Country Music Sensation Eric Church was TouchTunes' Top Played Artist of 2015. NEW YORK--(BUSINESS WIRE)--TouchTunes, the largest in-venue interactive music and entertainment platform, today released its annual Year-End Charts reporting the top played songs and artists of 2015. Based on the music played on its domestic network of digital jukeboxes and mobile app, TouchTunes’ year in review offers distinct insights into the music fans partied to across 60,000 social venues nationwide. 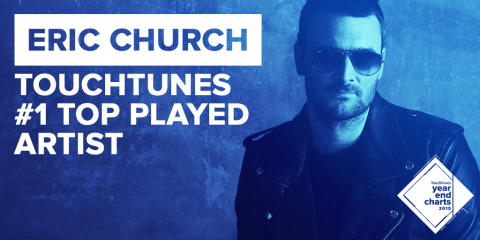 Country music sensation Eric Church was TouchTunes’ Top Played Artist of the year. “Music industry ‘experts’ have a multitude of metrics to tell you if a song is working or not, but there’s one way to truly know,” commented Church. “If a person wants to hear your song on a jukebox while they’re kicking back at their favorite bar, you've got something. Proud to have been the soundtrack to a lot of late nights.” Other top played artists in 2015 included AC/DC, Jason Aldean, Luke Bryan and Kid Rock. Though country artists dominated the Charts, it was rock music that reigned supreme as the Top Played Genre of 2015. Queen’s “Fat Bottomed Girls” was the Top Played Rock Song. Click here to view the complete TouchTunes’ 2015 Year-End Charts. TouchTunes is the largest in-venue interactive music and entertainment platform, featured in over 71,000 bars and restaurants across North America and Europe. TouchTunes' platform provides location-based digital solutions that encourage social interactions through shared experiences. Music is at the core of TouchTunes' experience with millions of songs played daily across the network and a mobile app that lets users find nearby jukebox locations, create playlists, and control the music in-venue directly from their phone. The mobile app is available on the iOS and Android platforms and has been downloaded over 4 million times. TouchTunes' award-winning products and services also include an integrated photo booth, the first fully licensed commercial karaoke system and an interactive TV messaging and engagement solution. Attract Media, a division of TouchTunes, is a highly scalable digital out-of-home activation platform that provides targeted advertising and promotional opportunities for consumer brands. TouchTunes is headquartered in New York City, with offices in Chicago, Montreal and London. For more information visit www.touchtunes.com. TouchTunes Releases 2015’s Top Played Jukebox Artists and Songs. Eric Church Crowned Top Played Artist; Ed Sheeran’s “Thinking Out Loud” Takes Top Played Song.